The original of that print is an engraving taken from a series of paintings by the British artist Reinagle. It was first used in "The Sportsman's Cabinet" 1803, by Taplin. The engraving was meant to represent the sentence by the Frenchman Buffon: " ... dogs of Greece, Denmark, Tartary and Ireland are the largest and strongest of the species." Consequently it was taken by many to be an image of the ancient "Irish greyhound", then again used by Capt. Graham after he had modified it, to be a model of the Irish Wolfhound. Many thanks for your intersting informations. I have this picture of the old German book "Hunderassen". The book Year of issue is 1904. The name under the print is "Schotsche Windhond" ( is then a old error, sorry). I will scan in the next time the forefront of this print, is over Deerhound in German with a photo and a another print. I have only this two original sides of this book in my collection. Here is the scan of the forefront of this old print ("Schotsche Windhond") . in the book "Hunderassen" of 1904. 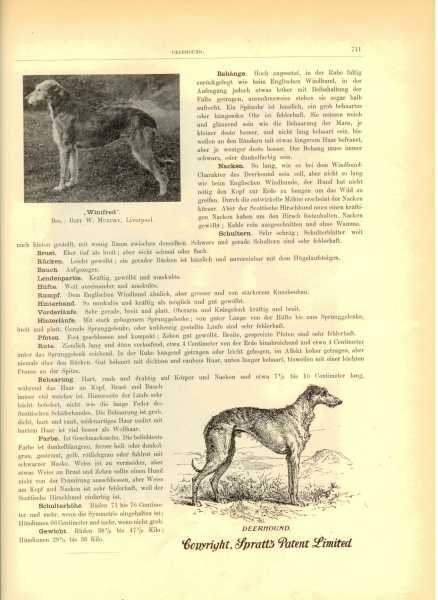 Regardles of whether it's based on a deerhound or Wolfhound its a very fine print Joerg. No need for you to apologise for "old errors". This sort thing happened and happens all the time. Particularly with respect to the Irish Wolfhound which is a re-created breed, bred mainly from Deerhounds. Constance. 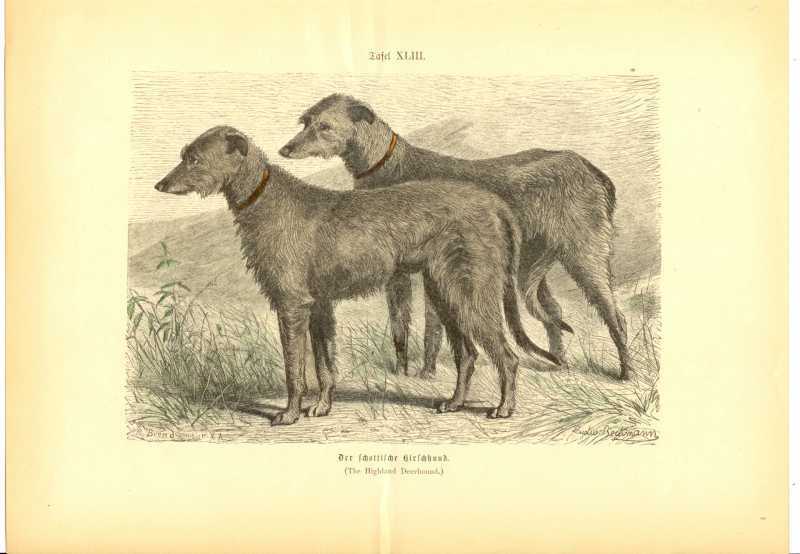 O. Miller was an Afghan person, from the US, an outsider to our breed, but had good academic connections, & wrote an extremely good chapter on the Scottish Deerhound and IW., and on understanding what a sighthound/windhund is. Thanks for your tip and the further informations. by Ananda BookBuyers over amazon.de . I hope the book is in 2 - 3 weeks here from the USA. It is an absolute classic in modern dog books. Her research was, for the time, extremely good. Let us know when you you've read it what you think of it! Yes, I will then write my opinion and/or my questions. I have received of the USA the book "Gazehound: The Search for Truth, Constance O.Miller" . Yes, my "Schotsche Windhond" picture is in the Irish Wolfhound chapter. 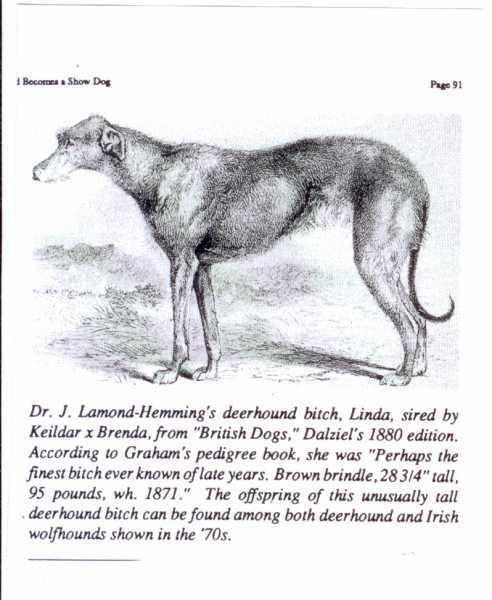 The book is very interesting with many informations about Deerhounds,crossbreeds and Wolfhounds + another breeds. Many informations are from Captain Graham. Last Edit: 7 years 9 months ago by Joerg Yoki. I have scan old pictures of the book "Gazehound: The Search for Truth". "Gazehound: The Search for Truth, Constance O.Miller"
Joerg, I'm glad you got the book and that you have enjoyed it. It is really very good. I guess they are just wrapping up the European Lure Coursing Championship in the Netherlands at this very moment. I hope all went well. Richard wrote: Joerg, I'm glad you got the book and that you have enjoyed it. It is really very good. Sorry, we are not in the Netherlands to this event. Joke and Jan are by the European Lure Coursing Championship. I think, we receive here in the forum informations in the next days. I wonder if Gerd Zekert will post videos on Youtube the way he did last year. I really appreciated that. I have received 2 old prints for my collection. Name: Deerstalking: " By George! 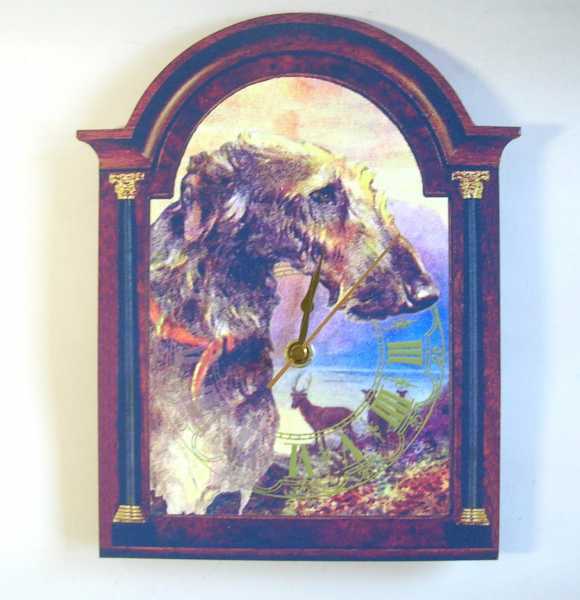 Missed again"
The print is of the newspaper "The Illustrated London News"
I have receive a very nice clock with Deerhound moive from the Cusidh Scottish Deerhounds Shop. Thanks Sophie for your friendly message. I think earlier than was hunted with Deerhounds still, the look of the Deerhounds was very different. Yes Joerg, they really looked more like rough-haired Greyhounds then. And so they should, even now. 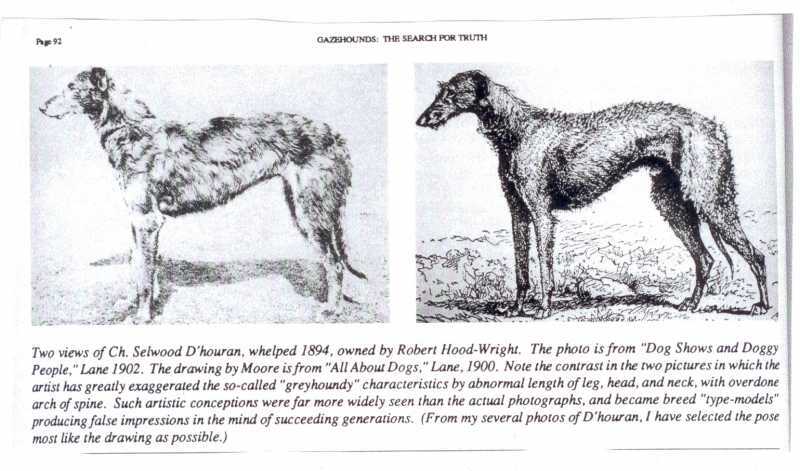 In past messages I have raised the matter of loss of type in the Deerhound, and was interested to see confirmation of that in other people's opinions here on this forum. Even though that opinion would appear to be a minority one. That loss of type still seems to be evolving. It is also telling that people, even breed experts, are expecting to see the changed type as the norm. They also appear to be projecting that back into the past, as if to say the 'modern', dare I say the coarser type, was the 'historical' type. As an example take the recent inclusion in the Deerhound Newsletter of the attached photo. With all respect to those that placed it with the claim that it portrays three Deerhounds - they don't really look like 19th century Deerhounds do they? The bronze cast, from 1869 by Arthur Waagen, a German animalier, is a very accurate portrayal of a Moroccan Kabyle returning on his Arabian horse after protecting his sheep (on the saddle) from a marauding animal (the head suggests a leopard). The dogs are the famous Atlas dogs, Aidi, the equivalents of which can be found all around the Mediterranean basin as guardian dogs. We see what we want to see, and as we do so, we risk becoming blind to the past. 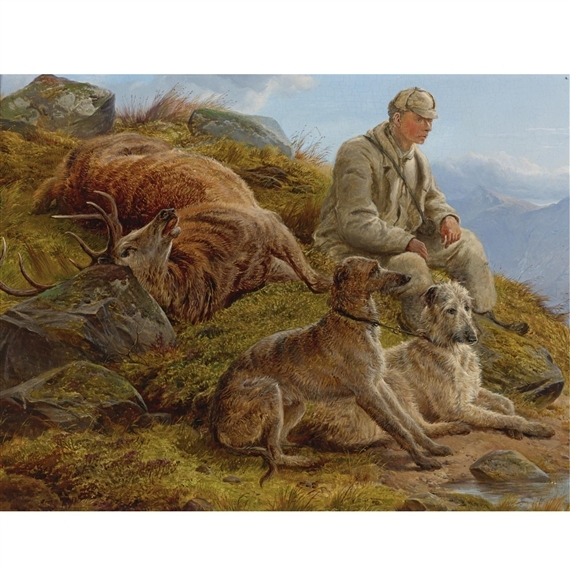 From my research it would appear that the dogs with rough greyhound like coats were mainly from the Scottish Lowlands and that a thicker and longer coat evolved long ago in the Highland dogs. 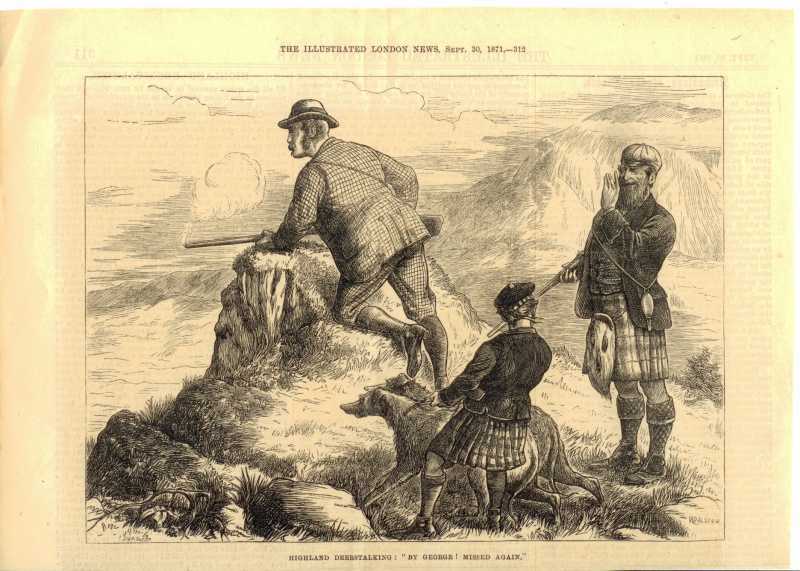 It may well be that with the advent of showing and improved transport that the Highland dogs started to be bred more with those from the Lowlands although this is but conjecture. 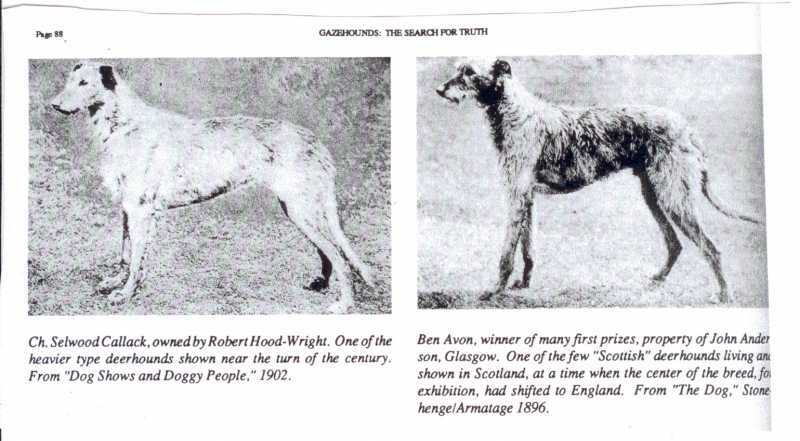 I have examined pictures of show winners from 1870's onwards and while it is true that most of those had rough Greyhound type coats you can also observe from the images that a thicker and longer coat was slowly starting to appear. I would like to add that the coat of the dogs would make little difference in its ability to hunt Deer. 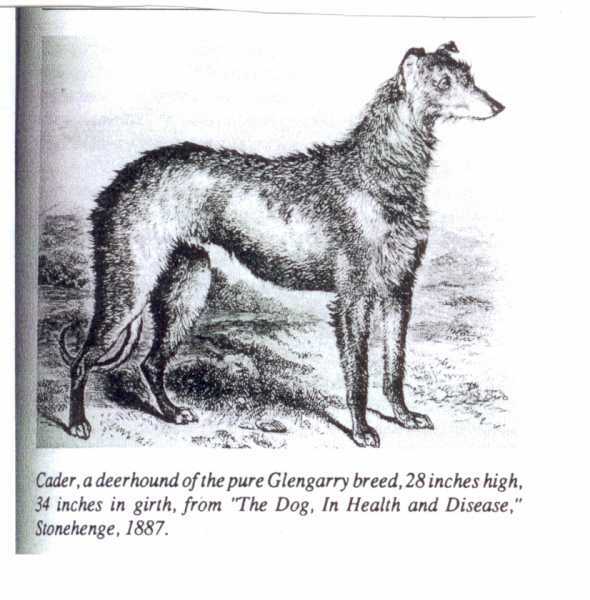 I would also add that it would be good to see more of a mix in present day coats but wonder how this could be achieved other than by a cross breeding with a Greyhound, as was done by Miss Noble. The Deerhound gene pool has been narrowed since the introduction of hunting with guns and also by the 2 world wars of the last century not to mention the present day ban on hunting with dogs in much of the western world. We are probably very lucky to have the Deerhound around today at all!